Chef owner Cam Tran proudly shares his passion for cooking in bold, black script on the back wall of Café Ce Soir: Le Bonheur est dans la Cuisine – happiness is in the kitchen. The phrase is borrowed from renowned French chef and advocate of nouvelle cuisine, Paul Bocuse. Like Bocuse, Tran reimagines classic French dishes by using modern cooking techniques and regional ingredients. His petit Portage Avenue bistro delivers brunch, lunch and dinner to a growing restaurant and catering clientele, providing an international dining experience just steps from Winnipeg’s busiest thoroughfare. “You have to have fun in the kitchen,” says the energetic 38-year-old, whose days begin with picking up fresh produce and end at one or two in the morning, when the last latte cup has been washed and dried. 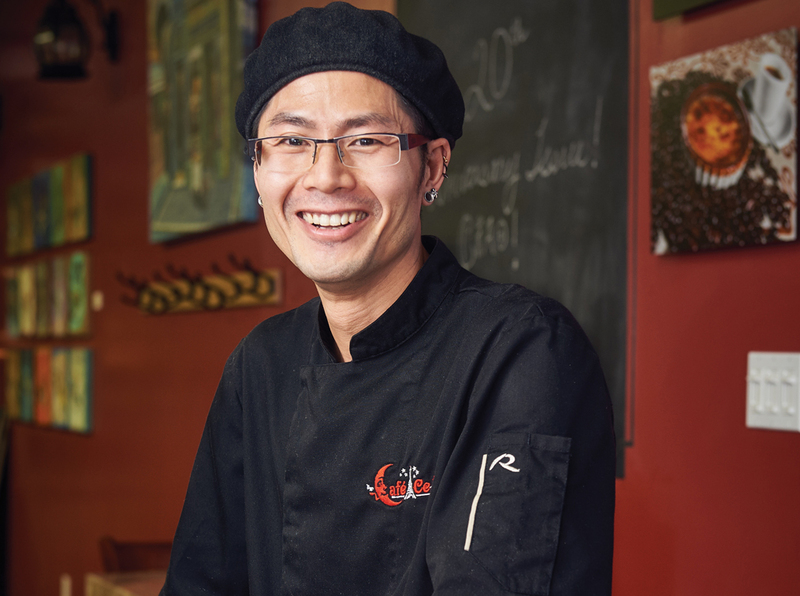 The lone Winnipeg member of the slow food movement, Tran is a firm believer in the value of sustainable foods, strong relationships with local producers and the celebration of culinary traditions and regional cuisine. This creed takes him out of the kitchen regularly, whether foraging for wild mushrooms for a lobster puff, picking blueberries and Saskatoons for jams and pies, or meeting with rural farmers to purchase eggs, bison and chickens. “The slow food approach is based on three interconnected principles: good, clean and fair,” he says. That means using quality, healthy produce that has been raised or grown in an environmentally friendly manner, and maintaining accessible prices for consumers and fair pay for producers. His menus focus on layered flavours, unique preparation and presentation, and availability of ingredients. Lunch might include a salad niçoise that substitutes soya beans for potatoes; dinner offers bison in a classic tartare. Everything is made in house, from the pizza dough to the mayonnaise, save for baguettes procured at local bakery A L’epi de Blé. It is clear in everything he does that this multi-talented renaissance man of the kitchen has a passion for his craft. During an interview with Ciao!, Cam darts between bubbling pots on the stove, prepping for a special event and a catering gig at once, while spinning yarns about his latest projects, which include writing a cookbook (The Art of Crème Brûlee) and completing a course in welding (conveniently allowing him to make his own cake rings and other cooking tools). The restaurant is celebrating its fifth year in business, a feather in the cap of the Vietnamese immigrant whose career path has more than its fair share of twists and turns. His father had been a glassblower in Vietnam but escaped after the war, one of the last boat people to flee the country. Cam, a child at the time, and his mother and sister followed, but were arrested and sent to prison. Thanks to benevolence of friends who bought their freedom, they attempted the journey again and the family was reunited in Winnipeg. Cam began working as a teenager, part time, with his father who cooked at The Moon Palace, forerunner to the Marigold. He graduated from the Culinary Arts program at Red River College in 1999 and after working at a handful of restaurants, quit the business and worked for seven years as a nursing assistant and advocate for special needs. The job fed his bank account but not his greatest passion. In 2010, a serious car accident prompted him to reconsider his life and work, compelling the once passionate baker to move to France to study as a pastry chef at the Michelin starred Gastronomicom near Montpellier. The instructors were exacting, pushing nearly every student to the point of tears, but he learned discipline and critical techniques, like making Italian meringues and crème brûlee infused with flavours. His internship in St. Tropez was yet another skill-stretching experience. When the head pastry chef quit, Tran found himself running the kitchen. “In France, chefs supply all their equipment,” he says. “I was left without any tools and had no money to buy them. For three months I created desserts for the hotel with just a hand whisk.” He notes that many of the French recipes had no ingredient list, forcing the budding talent to rely on his intuition and great palate. Before returning to Winnipeg, he spent five months in Asia, immersed in the foods and flavours of his childhood. Some of those memories have influenced his menu, like bison spring rolls marinated in teriyaki sauce, or escargot reminiscent of the dusky mollusks he used to retrieve from a backyard swamp. Armed with a vision to bring simple, delicious food to his old neighbourhood, he set about creating a gathering spot bursting with joie de vivre. His welcoming, 23-chair café with rich umber walls, open concept kitchen and tempting dessert case does just that. A small staff that he treats as family helps serve a dining room that is consistently packed, validating his gift for reinterpreting old school gastronomy. An ambassador of happiness and poster child for multiculturalism, the bon vivant continues to redefine the best of Gallic cuisine, with every banana cream pie, every dumpling, every Croque Monsieur is prepared by hand and with heart.